Over the past few years, Google’s John Mueller has been asked many questions about where to best redirect pages during a redesign or website migration. It’s a hot topic, but that makes sense. When you are changing urls, it’s extremely important to redirect older pages to the newer urls using a one to one mapping, if possible (via 301 redirects). For example, product A should redirect to the new url for product A on the new site. But what about situations where you won’t have a corresponding page on the new site? For example, maybe the product or service isn’t available anymore, a category has been removed, etc. And maybe those pages held a lot of search equity. They rank well, have built inbound links, etc. When running into situations like this, many webmasters are confused with what to do. Should you redirect the older pages to a different product or category? What about redirecting to the homepage? I mean, you want to save as much search equity as possible, right? But will that actually work?? Back to my first point about questions that John has been asked and his response. He has always said that redirects to the homepage or non-relevant pages can be treated as soft 404s. 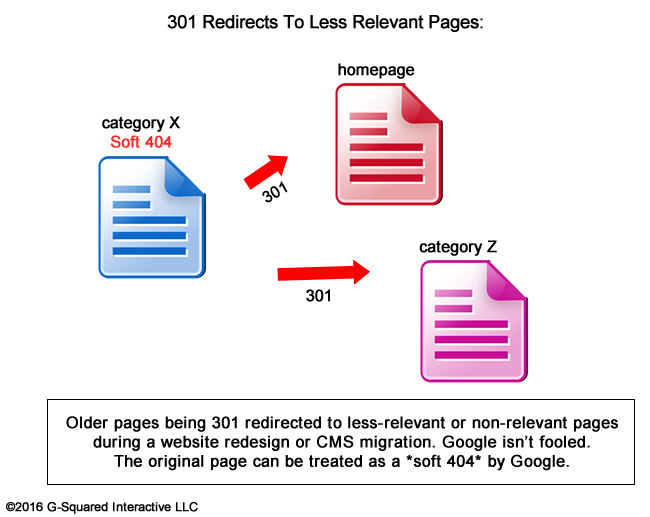 That means Google will essentially view the original pages that are being redirected as 404s. And that means Google will eventually remove those pages from the index (treating them as standard 404s), even though they properly redirect to other pages on your site. So, when this happens, you won’t be retaining search equity during the move like you thought, keeping those strong rankings, and subsequent traffic from those pages. Yes, read that last line again. 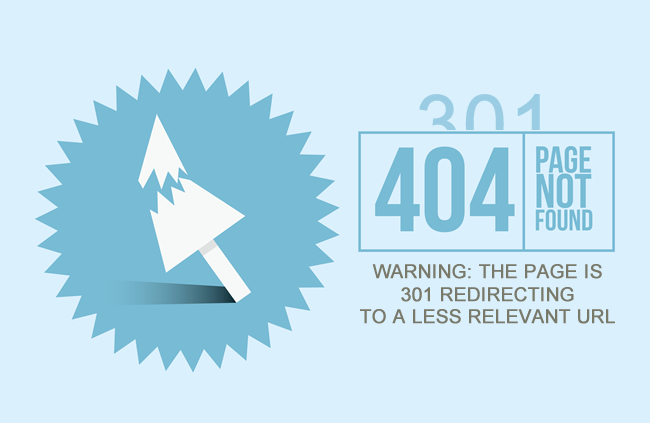 Signals will apparently not be passed to the destination page via the 301 redirect. So your nifty redirect to save search equity will actually mean nothing. The new page will not retain the rankings and traffic of the old page (as Google is seeing the page as a 404, and Google will ultimately remove that page from its index). That’s an incredibly important point to understand. In addition to the clip above, John Mueller commented once again today in another webmaster hangout video. Barry Schwartz covered that on Search Engine Roundtable this moring. Crazy timing! From a user perspective, this makes complete sense. If someone searches for a specific category, product, or service, and you redirect them to the homepage of your site, or a less-relevant category page, then that’s not the greatest user experience. Actually, it can be extremely frustrating for users. Several of the migrations this summer involved large-scale websites. And when you have large-scale websites, the size and complexity can throw several wrenches into your operation (including some gremlins). To make a long story short, several clients had categories, services, or product pages that would not be present on their new sites (in the new CMS). But those pages ranked well, had built links, etc. Several of the companies were moving at light speed to migrate to a new CMS, they were dealing with a lot of content (tens of thousands of urls or more in some situations), and some clients had multiple migrations going on at the same time (more than one site being migrated to a new CMS). 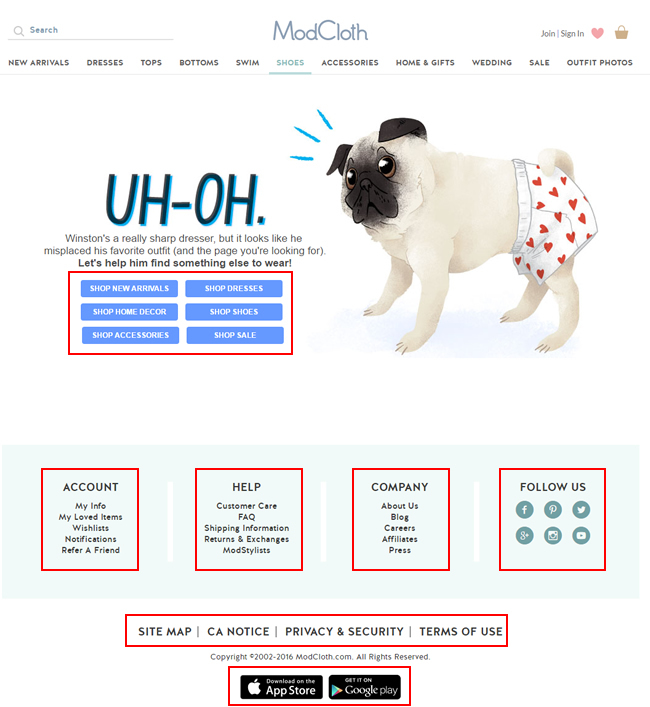 Based on their hectic schedule and the sheer amount of content that needed to be migrated, some clients made the decision to simply 301 redirect older pages with no equivalent page on the new site to top-level categories, other less-relevant categories, and in some cases even the homepage. What happened next was ultra-interesting to see and confirms what John has been saying for a long time now. It wasn’t long after the migrations went live before the first warnings started showing up. 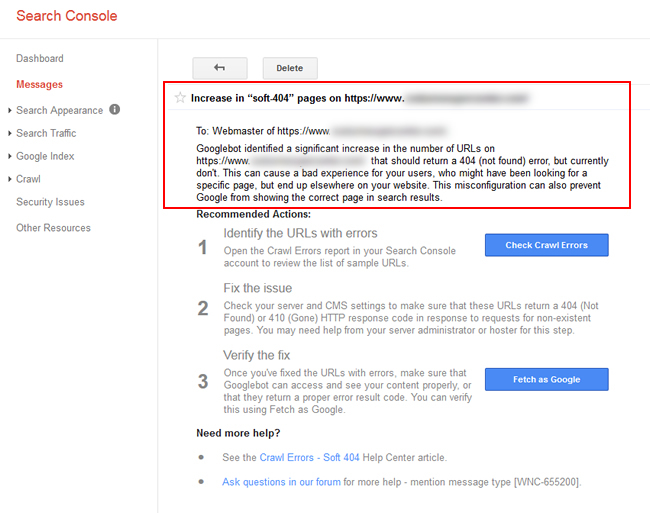 GSC was sending warnings for a spike in soft 404s based on each migration that implemented redirects to less relevant pages. And with Google treating those pages as 404s, rankings and traffic began to drop quickly for the older pages that were now being redirected to less relevant pages. So the morale of the story is that you won’t be tricking Google anytime soon with 301 redirects to less-relevant pages. This is important to know for any website that will be changing urls, going through a redesign, or CMS migration. If you want to retain strong rankings and traffic from Google, make sure you have a one to one mapping from the old url to the new url. If you don’t, and Google sees the new destination pages as less-relevant (or non-relevant), then they could end up as soft 404s. And if that happens, say goodbye to your strong rankings and traffic. But again, this makes sense for users. If someone is searching for “x category” and you redirect them to “z category”, which isn’t really the best content based on their query, then can you blame Google for treating the old page as a soft 404? I would find that user experience very frustrating, and many others would too. The best solution, and the one I mentioned earlier, is to use a one to one mapping for any important older urls on the site. For example, if you have an important category page that’s ranking well, driving traffic, has built powerful links, etc., then you should absolutely redirect that url to the equivalent url on the new site (via a 301 redirect). Don’t simply 301 to a less relevant category, or to the homepage. If you do, there’s a good chance Google will understand that and treat the urls as soft 404s. And then you’ll lose rankings and traffic anyway! If for some reason you don’t have a one to one mapping, and you can’t create a new page closely tied to the older content, then just 404 the page. It’s completely natural to have 404s from time to time. When you 404 the old page, Google will remove the url from its index, users will see your custom 404 page, and you won’t falsely believe that you can retain the signals from the old page. As John explained in the webmaster hangout video, just make sure your custom 404 provides enough value for users. For example, providing helpful information and links based on the page that has been removed. Basically help them find more, and better, information on your site! But to be clear, 404s should be a last-case scenario, especially with pages that are ranking well, driving traffic, and have built powerful links. If possible, make sure all of your top landing pages have a home on the new site. Then your strong rankings can remain, traffic from organic search and referring sites will remain, search equity will remain (based on links pointing to that content), etc. It’s only in situations where you absolutely cannot have an equivalent page on the new site that you should 404 the page. To wrap up, Googlebot is pretty smart when it comes to redirects to less relevant pages. John Mueller has explained several times that redirects to less relevant pages (or the homepage) can be treated as soft 404s. That means Google will essentially treat those pages as traditional 404s and eventually remove them from the index.